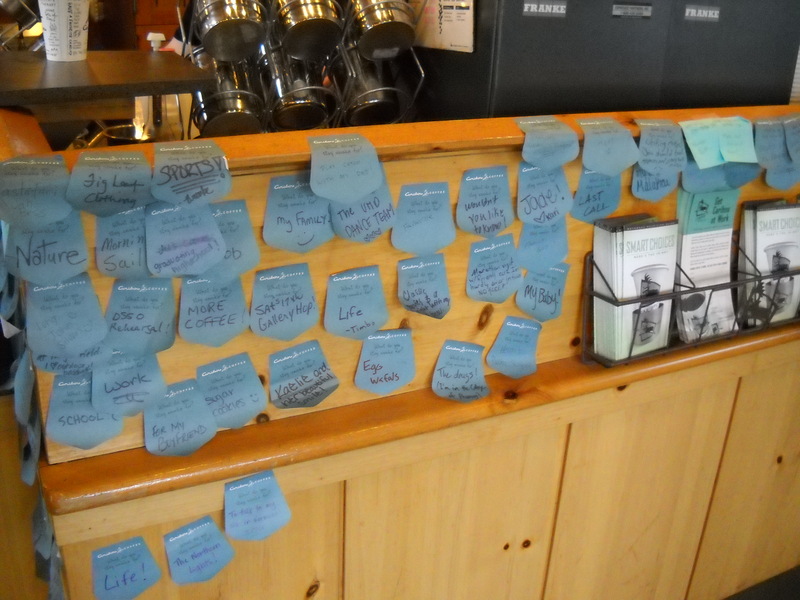 Visiting the Caribou Coffee in Duluth’s Canal Park location this weekend, I spotted a highly effective, low-tech method of social networking: sticky notes. With the phrase “What do you stay awake for?” printed on each little slip of paper, customers enthusiastically filled in the blank space. 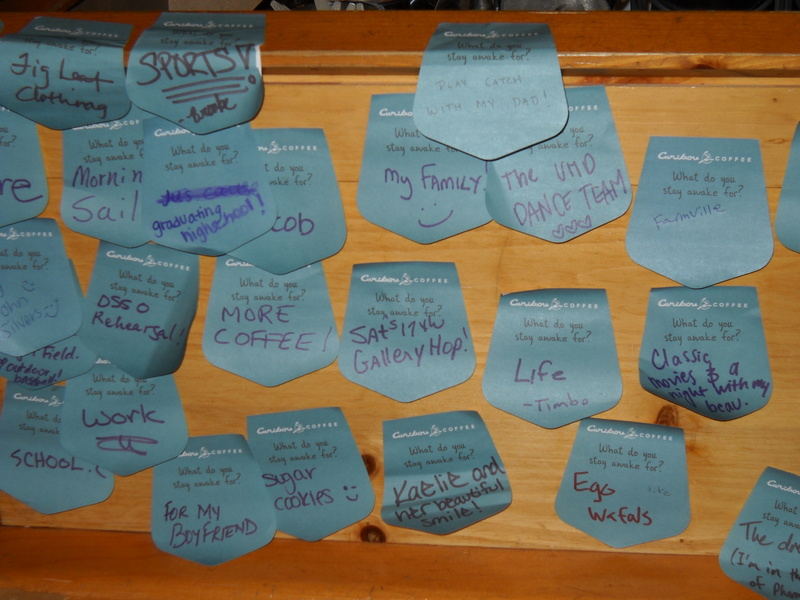 The sticky notes revealed a cross section of Caribou customers: teenagers, tourists, lovers, business owners, mothers and children. Their responses were surprisingly thoughtful, many of which spurred “conversation” from one sticky note to the next. In the age of Twitter and Facebook, it was wonderful to see these handwritten forms of expression that revealed much more about the author’s personality than pixels could ever do. Should your business consider this type of promotion? A closer look at some of the comments. 1) Builds a dialogue between the company and their customers. This type of dialogue can build a sense of good will and customer loyalty. Clients feel listened to and achieve a sense of community with other Caribou customers. 2) Provides valuable information about their audiences. This information could be used to create future advertisements, Facebook conversations, or in-store promotions that resonate with their target audiences. 3) Provides a satisfying distraction while customers wait for their beverages. 4) Provides the foundation for an online social media campaign. Should Caribou wish to take the campaign online, they have a simple model that’s already been tested for sparking conversation, that they can implement on Facebook and Twitter. Like this post? Please show the love by clicking on the “Like” link at the top of this page (next to the star). THANKS! This entry was posted on Monday, June 7th, 2010 at 10:28 am and is filed under Business Practices, Marketing your Business. You can follow any responses to this entry through the RSS 2.0 feed. You can leave a response, or trackback from your own site.